FenwayNation—Red Sox, Mookie, J.D., Bogaerts, Sale, JBJ—Founded 1/27/2000—9-Time Champs: Does Matt Carpenter's Resurgence Make Him A 3B Trade Target For Red Sox? 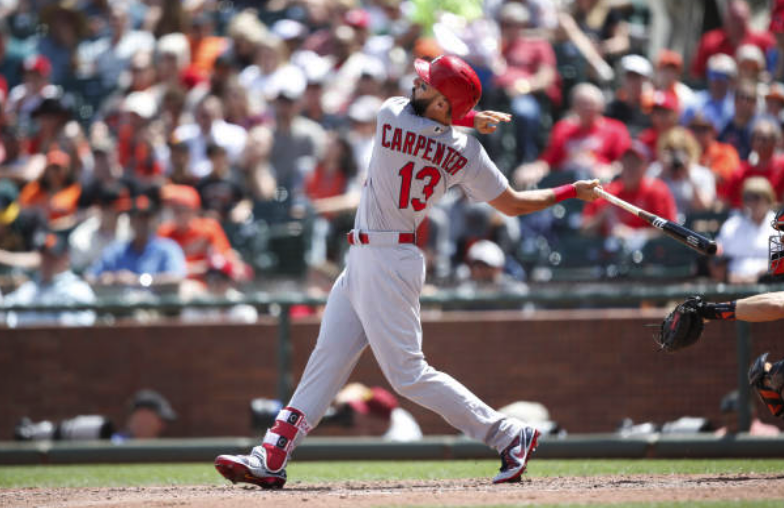 Does Matt Carpenter's Resurgence Make Him A 3B Trade Target For Red Sox? Anyone who saw Rafael Devers swing at the first pitch with the bases loaded last night (and pop out weakly to LF) knows the 21-year-old is struggling. His average is down to .242, and while he has 14 HRs, he's also made 20 errors in 92 games at third base. The Red Sox have to be asking themselves if they can afford the kid's "growing pains" during a World Championship run. Some observers have suggested that one option would be to trade Devers for Cardinals 3B Matt Carpenter. In fact, these same pundits suggest that the The Evil Ones should swap their young third-baseman Miguel Andujar for Carpenter. Why? The 32-year-old Carpenter is having a career renaissance in 2018—hitting .275 with 25 HRs and 53 RBIs this season (batting lead-off for the Redbirds). While we're not crazy about so-called "advanced metrics", WAR is at least an understandable stat. Carpenter's mid-season WAR was 4.3. As Craig Edwards of FanGraphs.com points out, Carpenter has been the best overall hitter in baseball since May 16th of this year (.340 AVG, .434 OBP, .728 SLG, 206 wRC+). Contract-wise, Carpenter is "controllable" for 2 /12 more years—with upcoming salaries of $14.5 million in 2019 and $18.5 million in 2020. It would be a gamble for Boston, but it might be a risk worth taking to make a World Series run more likely.